You are here: Home » Is Sportsmanship Prevalent at St. Paul’s? Is Sportsmanship Prevalent at St. Paul’s? The qualities of a good sportsman are quite simple. Marian-Webster defines good sportsmanship as “fair play, respect for opponents, and polite behavior by someone who is competing in a sport or other competition.” With a definition as succinct and elementary as that, you would think it would be easy to not only be a good sportsman, but an excellent one. Well, you’d be wrong. As the saying goes, you can talk the talk, but can you walk the walk? In today’s world of general cruel and spiteful actions towards each other, good sportsmanship is hard to come by. A person with good sportsmanship shows undeniable charisma to his opponents on and off the field. There is nothing wrong with being intense and passionate about your sport while in the moments of play. But after that whistle or buzzer goes off, all of that energy should not be concentrated as hate towards the combatant. A truly skilled and controlled sportsman should be able to turn on and off his game-play mode like a light switch. 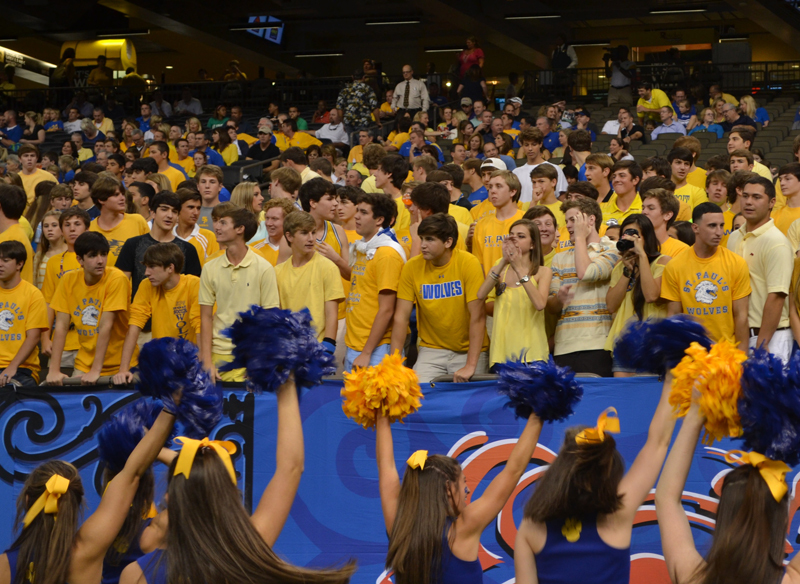 This many sometimes be a challenge to those who support SPS athletics, who literally bleed blue and gold. The athletes and students at SPS have done an overall good job with conducting themselves in this way. But, as we all know, no one is perfect, and students sometime find themselves on the short side of the stick when it comes to good sportsmanship between a rival school — especially because of the close demographic of all high schools on the north shore. And, we all know that one school that all St. Paul’s students can’t stand across the pond. And while I can’t say I don’t have a bit of competitiveness and aggression towards this school, myself, due to a rivalry that has been ongoing since my eighth grade year and even before that, I think we must look back and examine this heated battle between us. When you examine the situation closely, you’d actually find that we’re more alike than we would like to admit. In addition, I have noticed in my time at St. Paul’s School that sportsmanship should not only apply to the athletes on the field or court, but to the coaches and fans, as well. Often, there is just as much, and sometimes even more, unsportsmanlike conduct on the sidelines and in the stands as on the field. Between questionable chants at the other team, certain “trash talking” on social media (Twitter, Instagram, Facebook, etc. ), and rowdy behavior at games (which, again, I can’t say I haven’t been a part of). There is an understanding that some people have a certain passion for their team that might be on the borderline of insanity, but it doesn’t make it right. We have to remember that our love for the game should not cloud our good judgment just because we are in the heat of the moment. So to the players on both sides of the field and court, play your heart out. Give it absolutely everything you have, and then some. But when the game is over, and you go to shake hands with the other team, let it be genuine when you say “Good game,” instead of just mumbling it under your breath with no actual meaning behind it. And to the fans and coaches of SPS and our rivals, cheer your team on! Be enthusiastic, energetic, and exuberant while watching your team. But, do not make it a mission to bash and jeer the other team into the ground. Be an uplifting force for your team and cheer them on to victory! Whether on the field or not, we should all always be a display of good sportsmanship.